Ukraine plans to sign a "roadmap" with the EU that would show the risks the country is facing, and that would evaluate the necessary amount of assistance that can be provided in the form of loans at about EUR 10 billion, First Vice Prime Minister Serhiy Arbuzov has said. "In September I gave calculations: EUR 3-5 billion would be enough - this is the amount, which would make it possible to support us, to start upgrading. Today the crisis has deepened, it is necessary to do new calculations and get a certain sum, but it is not EUR 160 billion, it could be EUR 10 billion. And we asked for credit lines: when the time comes, we will repay," he told ICTV television. According to him, the amount for Euro-integration of EUR 160 billion previously announced by the government was only a theoretical calculation. "We're talking about redeveloping jobs over ten years. This is theory, pure theory," the official said. 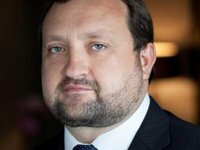 Arbuzov noted that mutual understanding with the EU regarding necessary assistance to Ukraine to minimize risks associated with the signing of the Association Agreement was achieved before the summit in Vilnius. "I'm not talking about the conditions of the association but about the conditions we planned to resolve before signing and after signing. Every time we were in Europe we found understanding, but we have not put this on paper," he said.